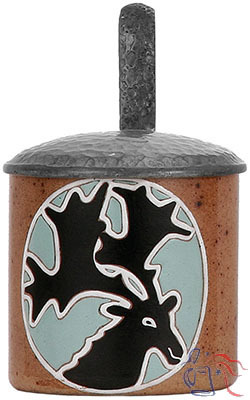 Stoneware, enameled transfer, 0.5L, pewter lid. Design attributed to Ludwig Hohlwein. One of a series of at least twelve, each featuring a different enameled central image, as well as a hammered pewter lid and thumblift. Steins in the series are typically marked “2176” on the base and sometimes, but not always, with a hand-painted decoration number configured as “Hn” (in this case “H10”).